In antiquity , the river is very famous for the Tulang Bawang malignancy crocodile . So the people who sail there and the residents who live there need to be very careful . According to the story , many people who just disappear there . On one day , tragedy was happening again . The missing person is a beautiful girl named Aminah . Surprisingly , even though the population seluryh Tulang Bawang River village look. No trace is left behind . Looks like he vanished swallowed by the earth . Far away from the incident , in a large cave tergoleklah Aminah . He had just woke up from fainting . How shocked he was when he realized that the cave was filled with priceless treasures . There are gems , gold , diamonds , and the beautiful - beautiful clothes . Possessions was issued a shimmering light . Has not exhausted his amazement , from the corner of the cave there came a great voice , " do not be afraid of a beautiful girl ! Although I tangible crocodile , actually I was a human being like you , too. Crocodile because I was cursed to be a very evil deeds first . Somad My name used to be , accomplished robber Tulang Bawang river . past I was always robbing every merchant who sailed here . All proceeds rampokanku I keep in this cave . If I need food then I sold a little treasure in the riverside village market . nobody really knows that I have built tunnels behind this cave . tunnel connecting this cave to the village . " Incidentally , the pirates crocodile has opened a secret cave where his residence . Aminah listening carefully and considering the valuable information . 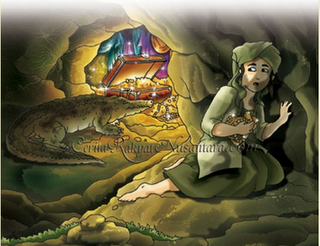 Crocodile was always giving gifts of jewelry . The hope is that Aminah wanted to stay with him . But Aminah desire to immediately return to his hometown rampant . One day , the little crocodile pirates off guard . He fell asleep and left the door open cave . The Aminah came out while on tiptoe . The cave behind the discovery of a narrow tunnel . After a long search the tunnels , he suddenly saw the sun . How excited he was when it came out of the mouth of the tunnel . There Aminah rescued by villagers looking for rattan . Then Aminah gave them gifts of jewelry brought in part . Aminah was finally able to return to their villages safely . He further peaceful life there .